And Lamah … and Gilgal … and Limhah … and Jeneum … and Cumenihah, and Moronihah, and Antionum, and Shiblom, and Shem, and Josh, had fallen with their ten thousand each. 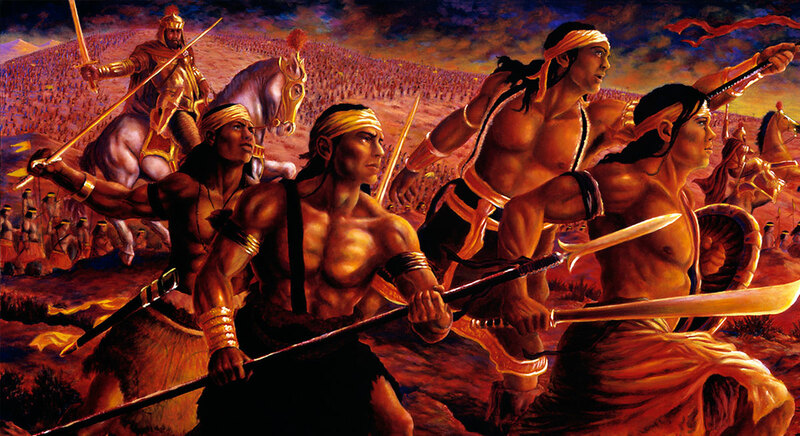 In the final battle at the Hill Cumorah, the Lamanites completely decimated the Nephites. Mormon stated that the Lamanites killed roughly 230,000 of his people. Yet this number may, at first, seem impossibly large. One wonders how an army of 230,000 people could exist during a time when the entire population of the world was probably only around 206 million. It is impossible to know exactly why these numbers are so high, but there are a few possibilities. The first thing to consider is that ancient texts often exaggerate population sizes. In the Old Testament for example, 600,000 Israelite males are said to have left Egypt (Exodus 12:37). When one considers the women and children that left at the same time, this would mean that 2.5 million Israelites likely left Egypt at the same time. Seeing that the entire population of Egypt at the time was likely only 2.8 million, these numbers seem to be clearly exaggerated. It is therefore possible that Mormon, like other ancient historians, simply exaggerated when talking about numbers this large. It is also possible that “ten thousand” represents a military unit and not an exact number of soldiers. In Hebrew, the word eleph can mean the literal number 1,000, but it can also mean a military squad. If this is the case, each military commander could simply have been in charge of 10 “squads” of unknown numbers, putting the number of casualties much lower than they might seem at first. While it is important to be aware of these different possibilities, some evidence suggests that these figures are accurate. The population of pre-Columbian America was much larger than many people assume. In fact, during many periods, the Americas were more populous than Europe. Thus, 230,000 casualties may have been a reasonable figure in Mormon’s day. The Book of Mormon’s own population data is consistent with this figure. As one examines the occasions when population size is mentioned throughout the Book of Mormon, and assumes normal population growth, 230,000 deaths in the final battle at Cumorah would make sense. One sees this from the size of actual armies in pre-Columbian America. In Mesoamerica, for example, even after rounding down significantly to account for the above-mentioned tendency of authors to exaggerate, the Aztecs gathered together more than 300,000 people for a war against a neighboring kingdom, and this was not noted as a remarkable event. The Quiche, similarly, were able to put an army of 232,000 men into the field, even though many refused to fight. This demonstrates that the casualty figures in Mormon are at least feasible. One disturbing possibility presented by Mormon 6 is that most of the Nephite population, including women and children, fought in this battle and were killed. [all his] people, with their wives and their children, did now behold the armies of the Lamanites marching towards them; and with that awful fear of death which fills the breasts of all the wicked, did they await to receive them (Mormon 6:7, emphasis added). There are two overarching approaches one can take when reading the Book of Mormon. One is to assume that the book is false, stating that each confusing element in the book proves it to be a fraud. The other is have faith, give the book the benefit of the doubt, look at it through an ancient lens, and realize that ancient texts are rarely as clear cut as modern readers would prefer. This second approach means that readers of the Book of Mormon need to read it in the same way that they might read other ancient sacred texts. They need to be patient with the book, consider it thoughtfully, and not dismiss details that seem strange as a sign that the book is not authentic. If the numbers are exaggerated, this is a reminder to the reader that the Book of Mormon was written like many other ancient texts. If the word “thousand” actually represents military units, this gives the reader a fresh insight into the translation of the Book of Mormon. If the numbers are accurate, this shows attention to accuracy of details that is exceptional in an ancient text. If the number actually represents the whole population, this reminds of the reader of the tragic nature of this final battle of the Book of Mormon. Exploring difficulties and potential solutions available—rather than dismissing them out of hand—creates opportunities to learn, discover, grow, and ultimately increase in faith. If something about the Book of Mormon seems confusing, out of place, or unexpected, this is what one would expect. 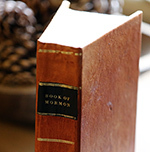 This simply means that the Book of Mormon joins the Bible as a book that needs to be pondered and considered carefully if one is to understand seeming oddities in the text. Regardless of if there were 23,000 killed or 230,000 killed, the destruction was an absolute tragedy, and a horror for Mormon and Moroni to witness. This is the appalling climax of action for the whole Book of Mormon narrative. A people who were blessed and righteous for so long ultimately destroyed themselves in senseless acts of violence and carnage. In a day when senseless acts of violence frequently trouble modern nations, it is easy to imagine the emotional effect on the Nephites. Similarly, wars raging across the earth today kill millions. If the modern reader feels compassion and heartbreak for the victims and families of wars and shootings that people from the US experience, then how much more should the reader feel compassion and heartbreak for the destruction of the chosen and blessed Nephites. Yet if the reader feels such poignancy for the Nephites, how much more should they now turn with compassion to those suffering the ravages of war and violence today. And if the reader is filled with compassion for those suffering today, consider how much more God weeps and is heartbroken over the destruction of His children (Moses 7:29, 32). See Book of Mormon Central, “Why are Horses Mentioned in the Book of Mormon? (Enos 1:21),” KnoWhy 75 (April 11, 2016). James E. Smith, “How Many Nephites? : The Book of Mormon at the Bar of Demography,” in Book of Mormon Authorship Revisited, ed. Noel B. Reynolds (Provo, UT: FARMS, 1997), 255–293. James E. Smith, “Nephi’s Descendants? Historical Demography and the Book of Mormon” Review of Books on the Book of Mormon 6, no. 1 (1994): 284–294. K. Klein Goldewijk and G. van Drecht, “HYDE 3.1: Current and historical population and land cover”, in Eds. A. F. Bouwman, T. Kram, and K. Klein Goldewijk, “Integrated modelling of global environmental change. An overview of IMAGE 2.4”, Netherlands Environmental Assessment Agency (MNP), Bilthoven, The Netherlands. “In contrast to the texts of other ancient Near Eastern cultures which typically provide relatively little information about the size of their armies, the Bible includes a great deal of information about the number of Israelite troops. Unfortunately, much of this information is problematic. . . The numbers appear quite high, especially considering the apparent size of the armies of other, better established contemporary nations. . . This difficulty has led many to discount the biblical numbers altogether, or consider them to be intentional exaggerations. Clearly, the Bible does include exaggerations. . . Thus, some argue that the biblical numbers often also exaggerate to make certain points, such as glorifying the God of Israel.” Boyd Seevers, Warfare in the Old Testament: The Organization, Weapons, and Tactics of Ancient Near Eastern Armies (Grand Rapids, MI: Kregel Academic, 2013), 53. Herodotus, the ancient Greek author, is similarly known for his tendency to never let historical accuracy get in the way of a good story. See Lee L. Brice, Greek Warfare: From the Battle of Marathon to the Conquests of Alexander the Great (Santa Barbara, CA: ABC-CLIO, 2012), 74. The Exodus account gives a number that could be read differently (see the next paragraph of this KnoWhy) but the figures in Numbers are much less ambiguous and show clear exaggeration. See Kenneth A. Kitchen, On the Reliability of the Old Testament (Grand Rapids, MI: Wm. B. Eerdmans, 2003), 264; James K. Hoffmeier, Ancient Israel in Sinai: The Evidence for the Authenticity of the Wilderness Tradition (New York, NY: Oxford University Press, 2005), 153–159. Carol A. Redmount, “Bitter Lives: Israel In and Out of Egypt,” in The Oxford History of the Biblical World, ed. Michael D. Coogan (New York, NY: Oxford University Press, 1998), 70. William J. Hamblin, “The Importance of Warfare in Book of Mormon Studies,” in Warfare in the Book of Mormon, ed. Stephen D. Ricks and William J. Hamblin (Salt Lake City and Provo, UT: Deseret Book and FARMS, 1990), 495–496. Kitchen, On the Reliability of the Old Testament, 264; Hoffmeier, Ancient Israel in Sinai, 153–159. Other ancient cultures used terms like this as well. The Roman military unit “century” was also the word for 100, but these units often did not have 100 people in them. See Smith, “How Many Nephites?” 286. Charles C. Mann, 1491: New Revelations of the Americas Before Columbus (New York, NY: Alfred A. Knopf, 2005), 94. John L. Sorenson, Mormon’s Codex: An Ancient American Book (Salt Lake City and Provo, UT: Deseret Book and the Neal A. Maxwell Institute for Religious Scholarship, 2013), 397–398. Smith, “How Many Nephites?”, 286.
joseph Smith said the New York Hill Cumorah was the hill where the final battle for both the nephites and the Jaredites. (See Letter VII written by Oliver Cowdery AT THE DIRECTION of joseph Smith. No where does it say the entire army was on one hill. Mormon had just 10,000 with him and others would have been on surrounding hills. Patricia: dec·i·mate ˈdesəˌmāt/ verb past tense: decimated; past participle: decimated 1.kill, destroy, or remove a large percentage or part of. "the project would decimate the fragile wetland wilderness" 2. (historical) kill one in every ten of (a group of soldiers or others) as a punishment for the whole group. Current definition includes the elimination of much more than 1/10. The word is being used properly.